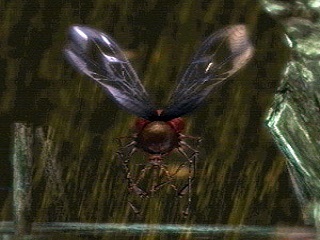 Giant Mosquito is an Enemy in Demon's Souls. You only encounter these guys a few times. They like to fly above your head and drop down to ambush you. Simply shoot them down with arrows or magic. They are weak to fire, weak enough that a strong magic user can kill them with one hit from Fire Spray.